It’s rare that I put “finally” in a headline, but I think this one warrants it: Mailbox, the ultra-awesome email client owned by Dropbox, is making its way onto the desktop. By doing so, it’ll be coming full circle and providing a seamless user experience on all the devices you’d want to view and respond to email on. Mailbox, of course, was nothing short of a revelation when it first launched on iPhone a little more than a year-and-a-half ago. Through a combination of swiping gestures to navigate email and the ability to snooze emails that you’d respond to later, it very quickly became a favorite productivity app for users striving to reach Inbox Zero. Soon after its launch on iOS, the company was acquired by Dropbox, and since then the team has been slowly rolling out support for other devices. That started with the launch of an iPad app, followed by the introduction of an Android version earlier this year, and finally announcing its plans for a desktop version. Meanwhile, the company has also been adding support for more services — like Yahoo and iCloud — while also expanding the app’s feature set. That includes an improved search functionality and the introduction of auto-swipe, which intelligently learns to archive and snooze messages based on your previous interactions with them. With each new platform and each new feature, Mailbox gets more useful and makes its users more productive. But the most important step in that process might be making its app available on the device where people do most of their actual work — and that’s the desktop. “Being in a mobile era is just shorthand for being in a multidevice era,” Mailbox founder Gentry Underwood told me in an interview. In bringing Mailbox to new devices, he said the team’s goal was to create a fluidity of experience while leveraging the benefits of each platform. On desktop that meant creating an experience that is fundamentally less simple but more powerful. While the mobile app was excellent for when users were in triage mode — that is, when they were quickly deciding which emails to archive, which to respond to, and which to snooze for later — it was decidedly less useful for composing messages of any length or substance. “The opportunity for us with mobile was to reimagine what it’s like to interact with your mail. Most other mobile clients at the time were clamped-down desktop clients,” Underwood said. But the situation on the desktop was different. 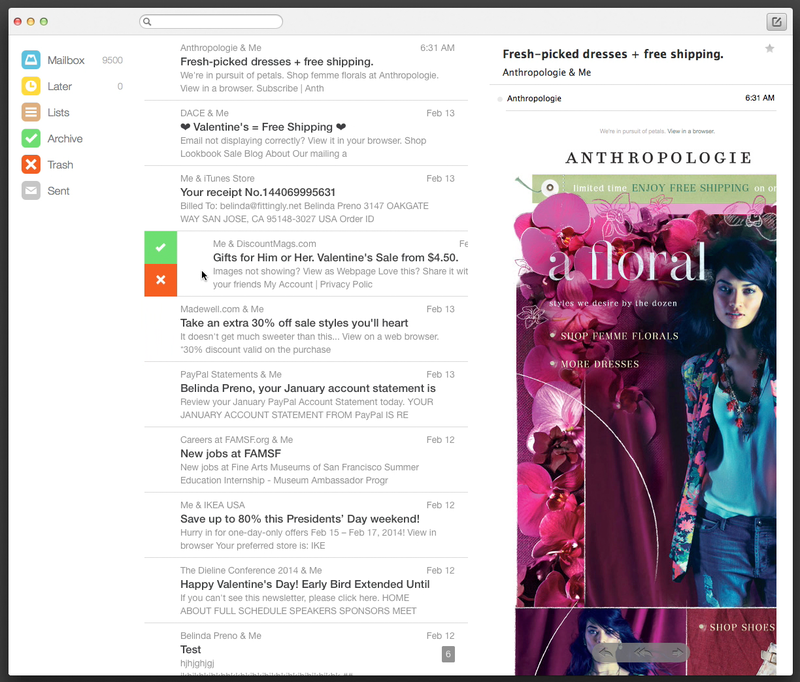 For Mailbox, the challenge there was to create the best experience out of about three decades of desktop email clients. And that’s part of the reason it took four months after it was first announced for the desktop version to be released in beta. For that reason, the Mailbox team took its time to develop the app and get everything just right. That means making sure that users can easily zoom through email using the gesture-swiping controls that they’re already used to with a mouse or trackpad. But it also meant adding keyboard shortcuts and other features to the desktop app that weren’t available on other devices. The end result is that desktop users have the same ability to quickly breeze through their email by archiving, saving for later, or simply responding to the emails that need their attention. But Mailbox makes moving between the desktop and mobile apps a seamless, and actually a delightful, experience. One of the key new features is the addition of drafts, which enables users to save responses that are unfinished and be able to complete them on any device. To make the feature work, users have to sign into all their devices with a Dropbox account. Once that’s connected, however, the app automatically and intelligently syncs drafts between devices so you could, for instance, start an email on mobile during your commute and finish it from your desktop when you get to your desk. Syncing up your account also enables you to “send to desktop” or “send to mobile” rather than just snoozing an email and setting a time or date for it to swing back to you. I’ve been a loyal Mailbox user since the beginning, and it’s simplified my email workflow and helped make me more productive. And while its gesture-based controls have been copied by the likes of both Google and Apple among others, no one has been able to replicate the ease-of-use that Mailbox built into its original mobile app. In testing the desktop app in conjunction with the mobile app over the last several weeks, I’ve been blown away at just how much more productive the combination of Mailbox on both platforms makes me. Even before drafts became available, I found myself being able to easily eliminate emails from my inbox that didn’t warrant a response, and to quickly respond to those that needed my attention. Soon after I was first introduced to the Mailbox mobile app, I wondered how I ever got along without it. And I feel the same way about Mailbox for Desktop. So kudos to Gentry and team for building something that will be truly indispensible — to me, at least. Mailbox was one of the first applications to introduce a “waiting list” for its application, and did so in part so that its servers wouldn’t fall down when the iOS app first came out. With the desktop client, Mailbox is again taking a very deliberate approach to rolling out the app and making sure that it can gradually — and gracefully — ensure that everything works as it should. For the Mac desktop client, the company has begun sending out emails to those who signed up to be part of its beta. When it’s time for a user to download the application, Mailbox will send them an email notification with what it calls a “betacoin.” Betacoins can be used to unlock the application during the installation process. It’s basically a free, single-user license for the beta, but the Mailbox team hopes that using betacoins instead of a code to unlock the application will make the process a little more delightful for users. Hopefully, though, the app will become more widely available on the Mac App Store, and free to all.